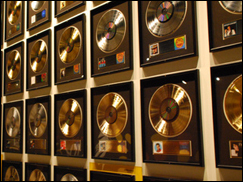 (Hypebot) – There’s one story that’s been circulating a lot over the last few days amongst musicians on social media – “2014 is first year ever with ZERO platinum-certified records” – it tells us that 2014 is (barring some kind of unforseen massive sales surge) the first year ever (ever??? no.) when no single band has had a platinum selling record. In the US. Even though the Frozen soundtrack has sold 3 Million copies. Meanwhile, 60 songs HAVE sold a million copies in the US. So what does this tell us? Without some much deeper analysis, not much. Here are a couple of hypotheses that would need testing to see whether there’s anything useful to be gleaned from this story or not. Secondly, we’d need to see evidence that equivalent marketing spends to previous million selling records have resulted in less-than-equivalent sales. Cos selling a million records was ALWAYS a *massively expensive thing to do*. Records don’t sell a million copies because they’re great. They sell them because they are good *enough* and because they are aggressively and widely marketed, and because of luck. The luck bit is often just that they ‘fit’, with the times, with a film that’s out, with the season (summer vs winter records etc.) They capture a mood. Think Green Day’s American Idiot. But mainly, it’s about the spend. So, how many records were marketed with the intention of selling a million records, with that kind of spend, but fell short? And if there is a drop in spend, why are label marketing departments doing that? Pre-emptively because of predicted lower sales, or because other things are doing some of their promotional work for them? Because if they kick-start a campaign, social media and streaming services take over to spread the word? I’ve no idea if that’s happening, cos no-one’s doing the numbers. Next, we need to look at overall sales. And for overall sales to be meaningful, we need to be able to slice them in useful ways. And – perhaps ironically – one of the most useful ways to ‘tidy up’ sales stats is to remove the top however-many massive selling records. Cos they’re kind of a red herring. Whether the biggest selling record in any given year has sold a million copies, or 3 million or 750,000 is no indication of what’s happening to ‘music’. Music in the sense that it impacts the lives of LOADS of musicians. Music sales at that top end have always fluctuated, but have always impacted our perception of what’s happening ‘to music’ in unhelpful ways. So, let’s take out the top 20/30/50 biggest selling records. Oh, sorry, what was that? No-one’s making those numbers available? OK.
Also, let’s take out sales of back catalogue. Say, anything over 5 years old. And let’s do that for ALL the stats that we’re comparing, for ever. Not because they aren’t useful for the people selling old records, but because they are mostly meaningless within a discussion that’s aboutnew music. That IS what we’re talking about here, right? So, the drop in sales could be a blip, it could actually be a sign that sales are ‘spreading out’ or it could simply be that the value proposition in a mass-marketed album by someone who is presented as conspicuously wealthy and successful that the listener will never have any kind of meaningful conversational relationship with just doesn’t fit the current pricing model of $10 on iTunes for the download or similar for a CD that they’ll just rip anyway. And for the same reasons, the argument that Spotify/streaming is hurting musicians falls on deaf ears. It seems absurd to tell an audience of Kanye and Taylor Swift fans that they need to spend more money on music to help starving artists… More on that soon. For now, we have bigger questions – why can’t we slice the sales figures up in useful ways? What value is there in any numbers that include ‘people buying their favourite 70s albums on another new format’ when talking about new music? What do the questions relating to marketing spend and its relation to sales mean for us as artists? By Steve Lawson from SteveLawson.net.